The professional development of sociologists involves specialized training through which we acquire and apply numerous skills. However, it is unlikely that our professional socialization includes training in how to inform the public about sociological knowledge and research through media involvement. As a sociologist who did not receive such training and was not prepared for the enormous unanticipated media and public interest given to my research topic, I provide a personal account of my unexpected metamorphosis into a media self and my experiences working with the media. I describe the nature of my professional and media obscurity, provide an overview of my initiation into media culture, and explore a self-transformation process that became necessary to manage the responsibilities associated with the media-assigned role of expert. I identify and examine the lessons I learned through extensive media involvement and the emergent realities of this involvement. Based on my experiences and resulting awareness of media culture, I offer to the discipline some suggestions and guidelines for media involvement and advocate for media training. Earlier versions of this article were presented at the annual meetings of the Pacific Sociological Association, 2004, 2006, and the Society for the Study of Symbolic Interaction, 2002. I wish to thank Mark Edwards, Mark Floyd, Jacque Lynn Foltyn, William Loges, William Lunch, Larry Pribyl, Todd Simmons, and Rebecca Warner for their insightful comments and supportive suggestions. Ortiz, S. M. (2002b). 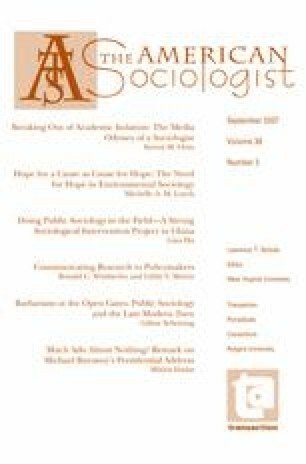 “Constructing Dependency in Coping with Stressful Occupational Events: At What Cost for Wives of Professional Athletes?” Sociology of Sport Online 5(2) http://physed.otago.ac.nz/sosol/v5i2/v5i2_2.html.